An email sent from the executive committee of the American Psychoanalytic Association yesterday to its 3,500 members explicitly informed them that publicly commenting on President Trump’s mental health was okay with them. Diagnosing of public figures from afar has been frowned upon by many professional associations for decades, under what is known as the “Goldwater Rule.” But some mental health professionals actually believe that they have an affirmative “duty to warn” the public. Laypeople, says Dr. Leonard Glass, a psychiatrist at Harvard Medical School, “have been stumbling around trying to explain Trump’s unusual behavior,” and the rule, Glass says, robs the public “of our professional judgment and prevents us from communicating our understanding” of the potential of any underlying mental disease. Glass recently resigned from the American Psychiatric Association, where he has been a member for 41 years and where the rule has been in place for three years longer than that. It was reaffirmed in March of this year. The American Psychological Association has no such rule, though it does have a culture of discouraging public statements of diagnosis from afar. Past president of the American Psychoanalytic Association, Dr. Prudence Gourguechon, agrees with Glass. “We don’t want to prohibit our members from using their knowledge responsibly,” she says, and “since Trump’s behavior is so different from anything we’ve seen before,” those insights might be especially helpful to a public confused by the behavior of their Commander-in-Chief. 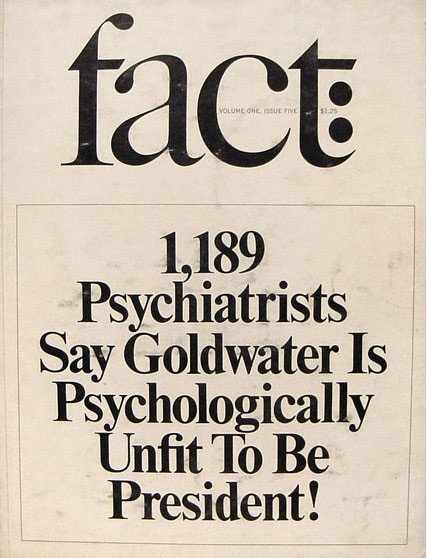 The “Goldwater rule” prohibits psychiatrists and psychologists from offering opinions about the mental state of a public figure without that person’s consent and without doing a direct examination. Some of those whom the rule constrains see it as itself unethical, since the mental state of a public official may well be at issue as a matter of public safety and wellbeing from time to time. Opposition to the rule has recently intensified. On the other hand, some don’t see much upside in such commentary, since such punitive diagnoses might tend to stigmatize other people with mental health disorders. Dr. Allen Frances is a professor emeritus of psychiatry and behavioral sciences at Duke University Medical College. He chaired the task force that wrote the fourth edition of the Diagnostic and Statistical Manual of Mental Disorders (DSM-IV), and he wrote a letter to the New York Times on the subject that was published on Valentine’s Day of this year.